Anyone into hot foods? How about Sriracha Sauce? 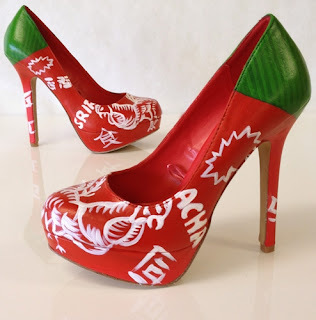 Well now you can match your sauce to your heels with these Sriracha Custom Heels. I've had Sriracha before. That junk is EXTREMELY spicy! I guess if you believe in "the higher the heel, the hotter the girl," these pumps are more than hot- they're spicy.